A cataract is an abnormality of the lens in which an opacity, or a cloudy change, prevents light from reaching the retina. Cataracts can develop in one or both eyes, and can lead to blindness. A cataract can take on a variety of appearances. The cataract might start as small dots that progress to include larger areas of the lens. The rate of progression is difficult to predict and might be very slow or very fast. Cataracts can be inherited, or can result from injuries to the eye, inﬂammation within the eye, and internal diseases that affect the eye (such as diabetes mellitus). Although it might be difficult to identify the speciﬁc cause, cataracts that develop without signs of other ocular or systemic disease generally are assumed to be inherited, or in older patients may be age related. To date, no known medical treatment has been proven to slow progression, prevent formation or reverse the changes caused by a cataract. Surgical removal of a cataract is the only currently available, effective treatment for cataracts in animals and humans that can restore vision. WHAT SHOULD YOU DO IF YOU SUSPECT A CATARACT? If you suspect that a cataract is forming in one or both of your pet’s eyes, call Eye Care for Animals and arrange to have your pet examined by one of our veterinary ophthalmologists. A complete ocular exam involving all structures of the eye is required to fully evaluate the cataract and the prognosis for surgery. If a cataract is not yet complete, we can examine the retina and other parts of the eye with relative ease. If a cataract is complete, we might not be able to examine the areas behind the lens. In addition, the earlier we examine a cataract case the sooner we can treat vision threatening inﬂammation in the eye that often occurs with cataract formation. Thus, the earlier we see your pet the better. We evaluate each eye for the extent and density of cataract formation, rapidity of change, presence and severity of ocular inﬂammation and probable extent of vision loss. Based on these findings, we will make recommendations on whether or not to pursue surgery. We recommend cataract surgery for those patients whose vision is signiﬁcantly impaired by cataract progression. It is a common misconception that a cataract must “ripen” or mature before cataract surgery can be performed. This is not the case. In fact, surgery performed on cataracts that have not been present for an extended time carries a better prognosis with decreased chance of post-operative complications. However, not all cataracts require surgery and if your pet’s vision is not signiﬁcantly impaired, it may be possible to delay surgery. Surgery may be recommended in one or both eyes. If both eyes are a candidate, your ophthalmologist might opt to stage the surgeries, operating ﬁrst on the most impaired eye. However, we usually recommend cataract surgery on both eyes simultaneously, if they are both candidates for surgery.. Before surgery, we evaluate each patient’s general health status prior to anesthesia. Tests may include blood work, urinalysis, EKG and/or chest radiographs (x-rays). If your pet is diabetic getting the blood sugar regulated prior to surgery is ideal. We work closely with your regular veterinarian to determine what presurgical testing is recommended for your pet. Some patients with severe dental disease benefit from a dental cleaning prior to surgery. In addition to pre-anesthetic evaluation, an electroretinogram (ERG) and ocular ultrasound will be performed to evaluate your pet’s retinal function prior to surgery. Your pet’s risk of glaucoma is tested via gonioscopy prior to surgery as well. Cataract surgery is performed on an outpatient basis after an initial pre-operative period (three to ﬁve days) of medications that are administered at home. We admit the patient to the hospital the morning of the surgery and administer eye drops at frequent intervals prior to surgery to prepare the eye. For cataract (and any other) surgery, we use the most advanced anesthetic agents and monitoring equipment available. During the surgery, our technicians carefully monitor your pet’s respiration, heart rate and rhythm, temperature, oxygen saturation and blood pressure. The actual surgical procedure takes approximately 30 to 40 minutes and the general anesthesia typically lasts 45 to 60 minutes. The procedure involves ﬁrst removing a small circular portion in the clear lens capsule that surrounds the cataract. Afterwards, we use a state of the art “ultrasonic vacuum” to remove all of the lens ﬁbers. Once the lens is removed, an artiﬁcial lens, designed for dog or cat eyes, is implanted into the lens capsule. The size of the incision in the eye needed for this procedure is generally less than half of a centimeter. During recovery, we continue to closely monitor your pet. Usually, patients are ready to be discharged from the hospital approximately two to three hours after surgery. Your pet’s eyelids might be partially sutured to serve as a temporary bandage. If so, we remove these eyelid sutures ten to 14 days after surgery. Postoperatively, you continue to administer the topical and oral medications, which we gradually taper to a low-level maintenance regimen. The use of these medications is critical to the success of surgery by helping to prevent infection and to control postoperative inﬂammation. An Elizabethan (E-collar/cone) is necessary to be worn after surgery to prevent self-trauma to the eye. We offer clear collars to help with peripheral vision while wearing the cone. Exercise restriction is also very important after cataract surgery to prevent disruption of the lens implants. No grooming/bathing should be scheduled for at least 3 weeks after surgery. Your doctor will further advise you on the use of the e-collar, exercise and when it is safe for your pet to be groomed. Some of these complications can lead to discomfort and blindness, but many of them can be successfully treated and managed with early intervention. Adherence to the post-operative medication and recheck schedule is critical to minimizing risk of complications. WHAT WILL MY PET BE ABLE TO SEE AFTER SURGERY? The surgical removal of a vision-impairing cataract can result in a dramatic improvement of functional vision. Some dogs need more time to adjust than others. 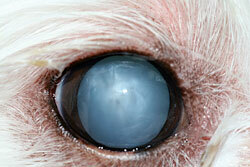 The implantation of an intraocular lens will greatly improve the rapidity and accuracy with which your dog will see. In some cases, we opt not to place an intraocular lens or may not be able to due to damage to the lens capsule. In these dogs, the visual image seen by the retina will be slightly larger and less distinct than normal. Farsighted vision will improve signiﬁcantly while nearsighted vision might be less accurate. Some owners may not notice this difference unless their dog performed work or tricks requiring high visual acuity prior to cataract formation. CAN THE CATARACT COME BACK AFTER SURGERY? Because we remove all of the lens ﬁbers during surgery, the cataract does not come back. In some cases, progressive scarring of the capsule that surrounded the lens may result in a recurrence of visual disturbances many years from the time of cataract surgery. This is very uncommon, but if it does occur in your pet, we can attempt to remove this scar tissue with a non-invasive laser procedure, that may be available at some locations.